← Giveaway Winner Announced at Last! I am delighted to bring you a fascinating post today from a dear friend, along with a gorgeous giveaway! Please welcome J B Grantham, author of Mr Darcy’s Guide to Pemberley, due to be released on 1st October 2017. The book will provide the reader with an opportunity to ‘walk’ the grounds of Pemberley guided by its Master, none other than Mr Fitzwilliam Darcy himself, as he invites you to discover its beauty and secrets. Julia very kindly agreed to be interviewed for my Blog and so, without further delay, here is our conversation! First of all, thank you so much, Cass, for inviting me to visit your gorgeous blog. I really appreciate this opportunity to talk to your readers about my new book and all things Pemberley. Since my very first meeting with Cass, which – very appropriately – took place in Winchester, we’ve been discovering various common interests and obsessions. Apart from Jane Austen (obsession, obviously), we share a love for Harry Potter (also obsession, of course), English history and countryside, themed jewellery and – quite perplexingly – the size of asparagus in different parts of the world (I won’t attempt an explanation of how this came about, but one has to tell it like it is)! 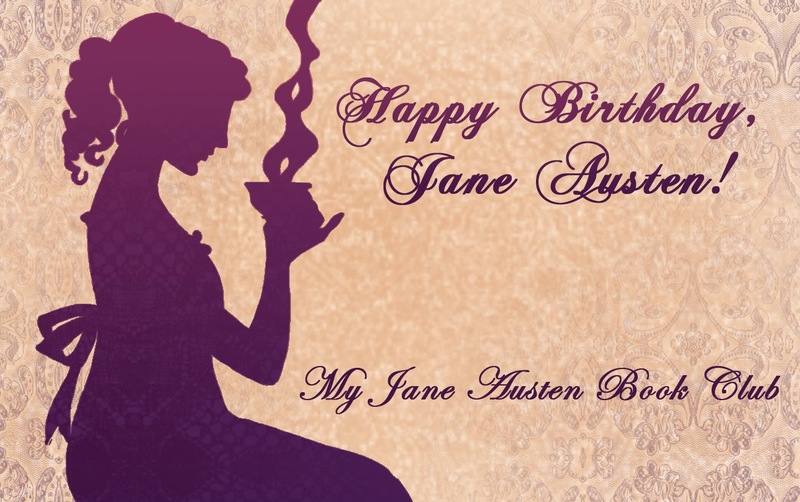 I was also privileged and delighted to attend a launch party at 4 Sydney Place, Bath for Cass’s book, co-written with her friend, Ada Bright, The Particular Charm of Miss Jane Austen, and it remains one of my favourite memories of attending a Jane-Austen-inspired event. The invitation to visit Cass’ blog could not have been met with more enthusiasm – I am very happy to be here and very grateful for such thoughtful questions. And I am grateful to you for joining me here, Julia! Now, tell us a little about how Jane Austen first came into your life and your first encounter with Mr Darcy! It was a long time ago, in what I refer to sometimes as ‘my previous life’. In that life, I was a medical doctor and a lecturer at a medical university in Russia. I’d worked on my PhD in gastroenterology and lived in happy (or, should I say, unhappy) ignorance of Pemberley, Elizabeth Bennet and Mr Darcy. This continued until, by some absolute miracle, one of the Russian TV channels purchased and broadcast the 1995 BBC adaptation of Pride and Prejudice. It was shown over 6 weeks, one episode a week, and I just couldn’t wait for each instalment. I must say, Jane Austen was not particularly known in the Soviet Union and, subsequently, Russia. Although it is very different now, the ideological bosses of the Soviet era did not see her books as political enough. Her characters didn’t suffer at the hands of ruling classes, their dreams and aspirations were too domestic, they were far from revolutionary, and the endings were too happy. Austen’s sharp tongue and merciless satire were, of course, lost on those who made decisions about what the ‘masses’ should read. I worked at a university, but no one in my department had read Pride and Prejudice or any other of Jane Austen’s books. Of course, I could not rest until I found the book in a Russian translation. One of the old professors had an ancient edition, and I read it in one sitting. With most of my female colleagues becoming enchanted with and bewildered by Mr Darcy, my favourite character was Elizabeth – then and ever since. So much so that, when the opportunity arose for me to come to England to do some research in my field of medicine, I accepted it only because it was the country of Jane Austen and Elizabeth Bennet. That’s fascinating, Julia. I’m so pleased you eventually discovered the pleasures of Jane Austen’s world. What, then, gave you the inspiration to create your gorgeous book, Mr Darcy’s Guide to Pemberley? I spent many years in the UK before I had a chance to visit Lyme Park, which for me always has been Pemberley. During the years when I couldn’t visit, I was searching the bookshops and then, later, the Internet, for an illustrated book about the property. I searched and searched and couldn’t find anything apart from a National Trust paperback. I bought it, of course; but it did not satisfy my desire to see more of the place. That is why, after my first visit to Pemberley a few years ago, I started drafting this book so that everyone could learn more about this beautiful place, especially people who live far away and cannot easily come and visit Lyme Park. I’m so happy you made that decision! The book is beautifully illustrated, but who created the drawings, and can you tell us a bit about the process? All the images, apart from those clearly mentioned in the notes, are my own work. The process is very long and not straightforward. It starts with pencils and watercolours, of course. Then I use scissors for various cut-outs, combine pictures together, scan them and edit further on a graphics tablet. Each image is re-scanned and re-edited many times, which is why it took me over three years to complete the book. And I am still trying to change some of the images! As for the photographs from the BBC 1995 adaptation, they are copyrighted to the BBC, so I purchased licences for each of them. It is a detailed process – you need to list the title you are using them in, the page number, even the size, but I felt it was the right thing to do. Your dedication and hard work has resulted in a delightful book! 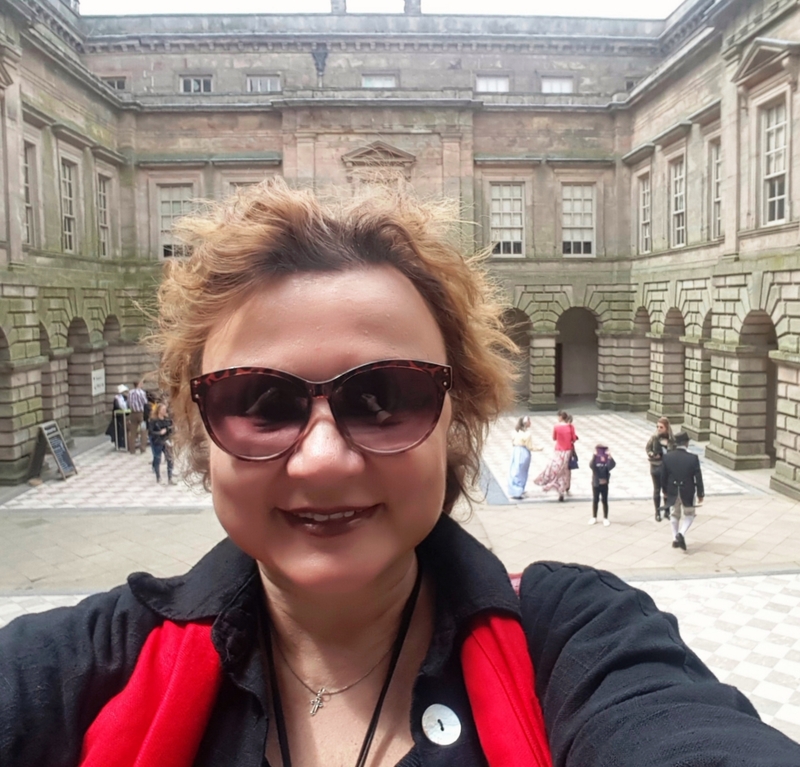 It is clear you have a deep love for, and knowledge of, Lyme Park in Cheshire, (the National Trust managed property which stood in for the exterior and grounds of Pemberley in the iconic BBC adaptation of Pride & Prejudice). 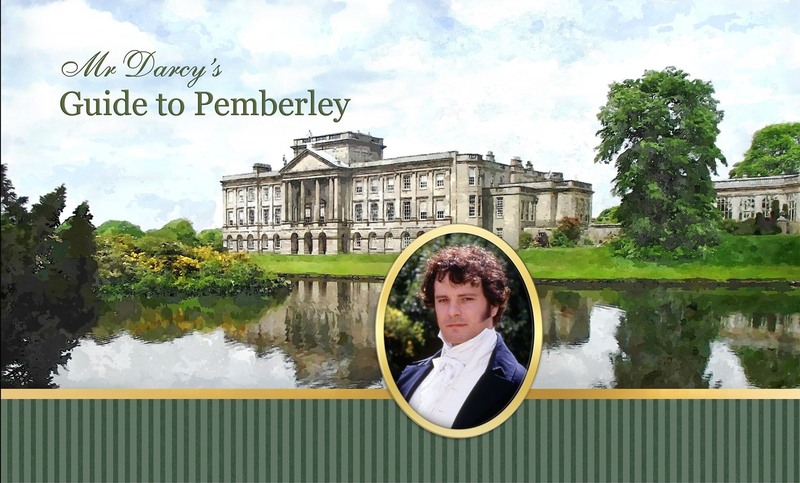 How did you research the ‘Pemberley estate’? I tried to read everything I could. As I said – it wasn’t much. Visiting Lyme Park and talking to its wonderful guides was a great source of information, but it still felt not enough, and then one day I just hit lucky! 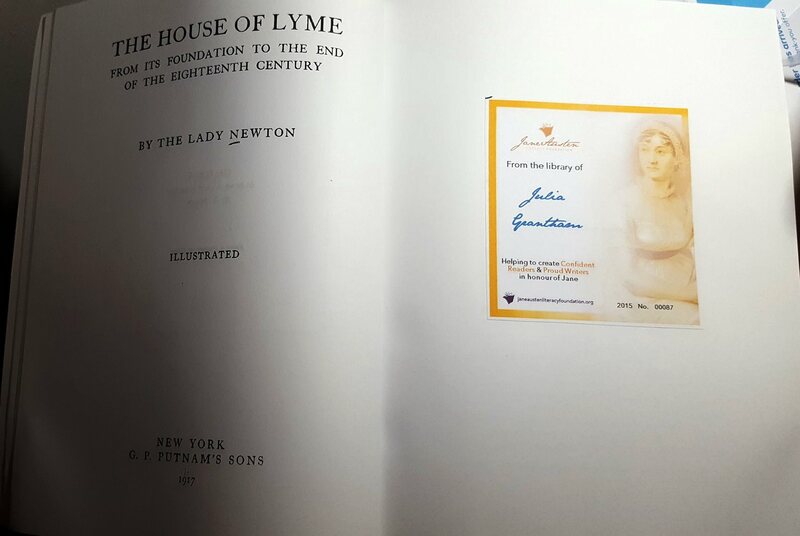 I discovered a reprinted book from 1917, published originally in New York, The House of Lyme: from its foundation to the end of the eighteenth century, by the Lady Newton. It is a thick tome, and, of course, I was writing about Pemberley, not the history of the Lyme Park estate, but I used several details from the book in the Guide, such as the first names of both Mr Darcy’s grandfather and his father. I cherish this book so much that my very first Jane Austen Literacy Foundation bookplate went into it. I am pledging 10% of the book’s profits to the Foundation, which raises money for literacy projects in Jane Austen’s name, and I am very happy to support a worthy cause so close to my heart. That’s a wonderful gesture, Julia. Now, can you share what your favourite part of the grounds is, the place where you like to sit and just take everything in? In the grounds of Pemberley I usually walk and walk – there is so much to take in before dark. But, when my legs give up under me, my favourite place to sit is, undoubtedly, the covered top terrace of the rose garden. It is important to mention that some constructions at Lyme Park were added later than Pride and Prejudice’s timeline. However, they featured in the TV adaptation and are there now for every visitor to see. To deal with this dilemma, I marked with an asterisk all the places that did not exist in 1814 (when Mr Darcy was writing his guide book), but are there now. It is an inevitable challenge when writing this sort of book – a fusion of fantasy and reality – but my aim was to do justice to a place I love and, as much as possible, to enable the reader to separate the reality from fiction should they wish to. That is why the names of real people – architects and craftsmen – are highlighted in bold italic, while fictional characters are not highlighted in this way. In other words, I took all precautions to keep the fantasy alive while staying true to facts. And you’ve done a wonderful job! You have a beautiful garden of your own. Did any part of it inspire aspects of your book – the illustrations of the individual blooms, for example? 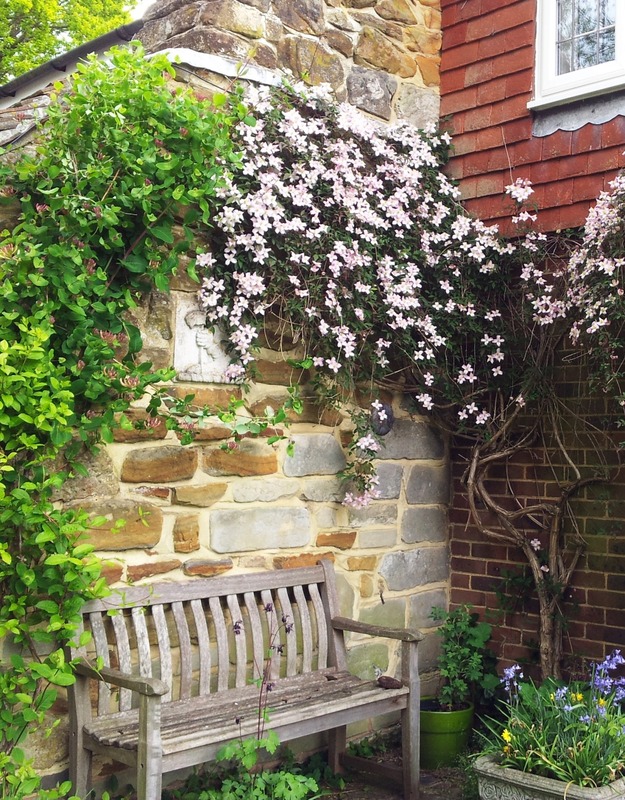 It is rather the other way around, in that I always have Pemberley in mind when I work in my garden – not that it is anywhere near it in scale or grandeur, but one always can dream. For example, ever since I noticed small islands of daisies growing in the lawns of Pemberley, I started leaving them to grow in my lawn – daisies, white clover – these little patches of flowers look great on the lawn and attract hundreds of bees, and the idea came to me from Pemberley. I’ll tell you another amazing story about our garden and Lyme Park. Our house is quite old, with one wall dating back to 1800, and there is a plaque built into the outside chimney depicting an arm holding a banner. Imagine my surprise and delight when I discovered these severed arms with a banner can be found in abundance at Lyme House! 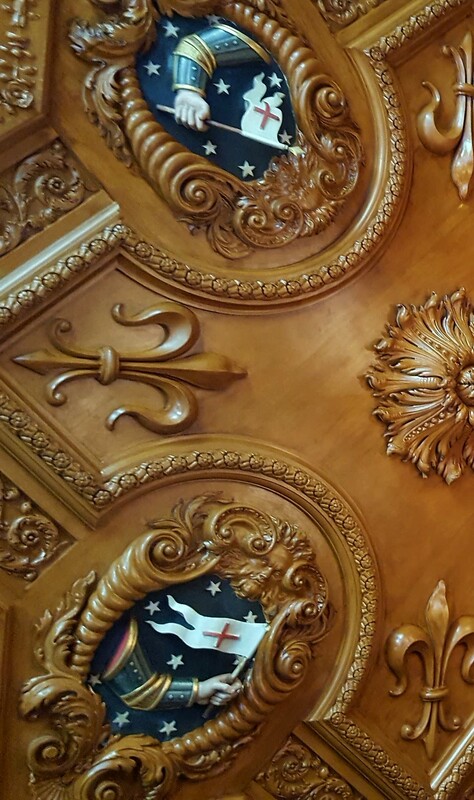 How astonished I was to discover this was the ‘Augmentation of Honour’ of the Legh family, an honour bestowed on the family in 1575 by Queen Elizabeth I, in recognition of a courageous rescue of the Black Prince standard by a Legh family ancestor, Thomas Danyers. How this symbol found its way onto the chimney of our house is a mystery I am currently trying to decipher. Wow, that’s fascinating, Julia, and what a wonderful potential connection to a place that has become so significant to you! Thank you so much for coming along to share some of the background behind your love of Jane Austen’s Pride and Prejudice and the inspiration behind the gorgeous and innovative Mr Darcy’s Guide to Pemberley. I’m proud to say I was asked to write a review for inclusion in the book, and I highly recommend it, not only to fans of Pride and Prejudice, but anyone who loves history, English landscapes, stately homes and stunning gardens. J B Grantham is a wife, mother, medical doctor, PhD, university lecturer, businesswoman, training consultant, video producer, an aspiring author of children’s fiction, a Harry Potter fanatic, Jane Austen enthusiast, the mother of cats (two), ducks (multiple) and a pheasant, a Facebook blogger with a great following (thank you, guys! ), a Creative Director of the Jane Austen Literacy Foundation (we are all volunteers there), a writer and illustrator of Jane Austen-inspired travel fiction. Sumptuously presented, and doing full justice to the stunning place it describes, this book is the first and only of its kind. It is only available as a hardback, wrapped in a smooth dustcover with gold emboss. Inside, the book is printed on high quality silky paper with full colour paintings adorning every page. Hand-drawn maps guide you around Mr Darcy’s extensive estate and perfectly imagine every detail as if you were walking the garden paths beside your generous (and handsome!) host. Because the book will be expensive to print, pre-orders will be fulfilled first. There may then be some available for general sale. You can pre-order to save money and secure your copy. Firstly, this way you secure your copy. The book is a limited edition and the number of copies produced will be strongly determined by the number of pre-orders we receive. Secondly, there is a special introductory price on pre-orders, saving £5 off the regular price of the book. The book will be released on 1st October 2017, and you will not be charged until the date of release. J B Grantham is delighted to be supporting the Jane Austen Literary Foundation, a registered not-for-profit organisation. 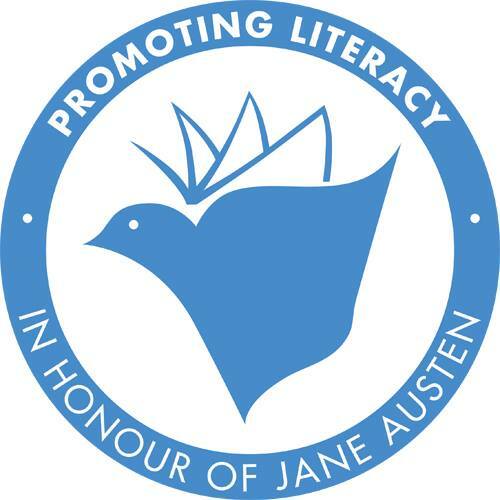 The Foundation was created in honour of Jane Austen, to improve global literacy rates by raising money to fund reading and writing resources for communities in need across the world, by Caroline Jane Knight, Jane Austen’s fifth great niece, who has also kindly written the Foreword for the book. Julia is offering a fabulous giveaway for one lucky winner! It’s open internationally, is absolutely unique and cannot be replicated or purchased in any shops because it is completely handmade by talented artists. Four Jane Austen books pendants (they can be worn as individual pendants, or as part of a necklace or a charm bracelet) – all by talented young artist, Alyona. NB: The giveaway will run until midnight UK time on Monday, 4th September 2017, and the winner will be announced here on the Blog. If the prize is not claimed within 48 hours, a further draw will be made. This entry was posted in Guest Posts and tagged J B Grantham, Lyme Park, Mr Darcy, Pemberley. Bookmark the permalink. 93 Responses to Interview and Giveaway with Author J B Grantham! This book sounds wonderful! We can never get enough Pemberley and the detail that you are going to give us will only add to the visuals we have from the movies and stills. Thanks Cass for featuring J B Grantham. Doesn’t it sound wonderful, Jen? I can’t wait for my copy to arrive! Let us know your favourite ‘friend’ from Austen to enter the draw! What a fascinating interview. And the book sounds just beautiful. It made me think how much I would love a friend like Elizabeth Bennet Darcy, who is clever and witty and fun loving … and has those amazing grounds at Pemberley to see! Wasn’t she a lucky lady, Lady Susan? Good luck! Bienvenue, Maria, et bonne chance! Merci à vous pour vos belles anecdotes et pour votre phénoménal travail pour nous offrir ce livre magnifique ! I loved reading this interview! The book sounds like it is just the right combination of Jane Austen imagination and historical detail of a grand estate. The beautiful grounds of Pemberley would be a lovely place to walk with a friend like Elizabeth Bennet or Henry Tilney, who are both fond of walking and quite witty! It’s truly delightful, Sarah, and beautifully presented! Good luck! Thank you for the insightful interview. I am in awe of your life story, interests and pursuits. The book sounds fascinating (who wouldn’t want a guided tour of Pemberly with Mr. Darcy?) and visually stunning. I would select Charlotte Lucas Collins as my friend. She is not afraid to kindly tell the truth or point out flaws in a loving manner. She is a good listener and wants the best for her friend, Elizabeth. Since Elizabeth rejected Mr. Collins, Charlotte accepted as she didn’t want to be a burden to her family as she really was on the shelf, and she wanted to manage her own home. Charlotte never lorded over the Bennets that she would be the next mistress of Longbourn. Charlotte is able to forebear not only her husband but also Lady Catherine. Charlotte is truly a faithful friend. Thank you for the exquisite giveaway. Good choice, Eva, and good reasoning!! What an interesting choice! Indeed, if Elizabeth, such an excellent pundit of human follies, prefers her to any other friends, it should be an outstanding recommendation. I love Charlotte’s dry sense of humour and her realistic view of life too. I am so looking forward to my copy, too, Janis! LOL re Henry. Good choice in Eleanor, I agree! I would choose Mr Bennett. A brilliant man though somewhat indolent, but he allowed his children freedoms to develop as individuals unknown for his day. Elizabeth Bennett was able to attract Fitzwilliam Darcy from all others despite her lack of dowry and inspired a passionate and deep loyal love that no other could ever do to this complicated man. Elizabeth was able to understand and love him because he was intelligent like her father and did not hold her thoughts and ideas in contempt because she was a woman, but he was so much more than her father and could look up to him. Mr. Bennett would have been an asset to any individual at that tme because of his freedom to allow expression to his daughters and others. That is why I would choose him a my friend. An inspired and very original choice, Debra! There is nothing better than a book born out of a passion and created with love. Very excited to see this one in all its juicy glory! I can’t wait to get mine either! Do let us know your Jane Austen ‘friend’ so we can enter you in the draw for these delicious prizes! Choosing one character for a friend is tough. There are several that I would dearly love as friends. If only choosing one, I will go with Colonel Fitzwilliam. I think he would be delightful to have as a friend. He is loyal and funny. I would always know I could count on him to be there and to make me laugh! Thank you for such an enlightening interview and delightful giveaway! An ultimate friend! Absolutely! The one who can be with you when you need him most and make you laugh at yourself, when you take yourself too seriously. Love your choice, Janet! Oh, I love your choice, Janet! I would definitely like Colonel Fitzwilliam to be in my corner too! Passion and obsession seem to go hand-in-hand with Jane Austen! Now to have such a gorgeous hardcover book showing ‘Pemberley’ in all it’s glory is amazing! I had pre-ordered my copy last month when ‘All Things Jane’ first posted Julia’s book! So looking forward to receiving it! 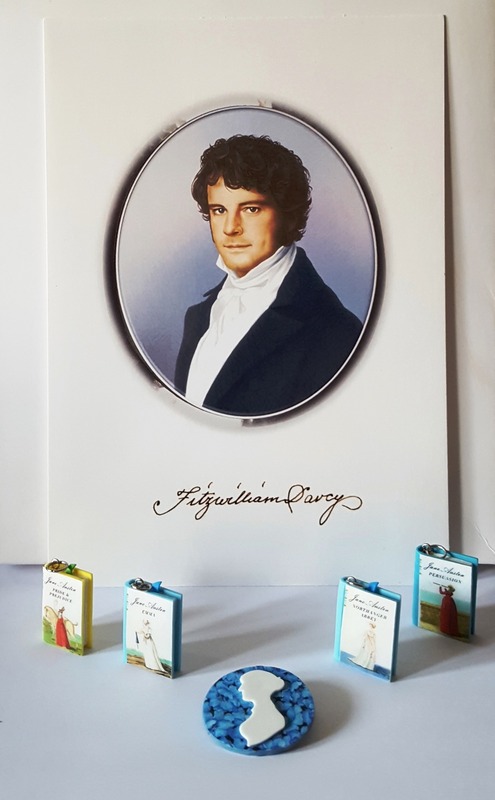 As I was fortunate to win the gorgeous print of Mr. Darcy for commenting last month, please do not enter me in the giveaway! However, if I had to choose one friend, it would have to be Elizabeth Bennet. The talks we could have on our rambles about books, Mr. Darcy and all things Pemberley! I am so looking forward to getting an actual copy in my hands too, Carole! Congrats on the earlier win! I would love to be a friend of Charlotte Lucas Collins. She is practical, kind and married to a clergyman; I am too! I could relate to parish concerns, domineering patronesses, and although my hubby is NOTHING like Mr Collins, I KNOW she needs a true friend to visit and vent with. I also often think she must of been dear to our dear Jane Austen, having familial bonds with clergymen. That’s a good point re Jane’s bonds to the clergy, Darcy! What a wonderful book. I’m afraid that I, too would choose E. Bennet. I think she would find a way to bring wit to nearly every situation. I would treasure the walks we took together. Together we would find a way to become more accomplished with our needlework, always laughing at our mistakes and viewing the inevitable blood drops as badges of honor. Loving the mental image of you pricking your thumbs with Elizabeth Bennet, Beth! So far Elizabeth Bennet is a firm favourite for a friend. At least we can all be sure that Jane Austen would not dislike us on this ground. 🙂 Remember what she wrote about Elizabeth? While I love reading about Elizabeth, I think I would like Anne Elliot as a special friend. I always get the feeling tbat Anne would be by your side no mattet what trlubles or concerns you had. I think the book looks so lovely. The book looks gorgeous, doesn’t it? Wonderful interview! The book looks amazing! Thanks so much for a chance to win a copy! Charlotte Lucas would be my choice for a friend. She’s intelligent, loyal, and she’s a realist. She would keep me grounded. So pleased you enjoyed the read, Pam! I think I’d love having Mr. Darcy as a friend. I know without a doubt he’d have my back if anything happened. Those types of friends are Priceless! I would love to have Anne Elliot for a friend. She is level headed and loyal. She is also a good listener, who could use someone to tell her trials to who would listen to her. I have preordered the book as it is one I would love to add to my collection. Anne is my choice too, Debbie! I’ve pre-ordered the book too and can’t wait to receive it! Thank you very much for pre-ordering! The book looks lovely. I love the concept of how the illustrations were made. I would like to be friends with Mrs. Gardiner, since she was such a favourite. What a lovely choice, Suzan! You’re quite right, of course; Mrs G was a firm favourite with the family and most especially with Lizzy, and later, Darcy! I believe Elizabeth “Lizzy” Bennett would be my friend. She is a forward thinker and tends to speak her mind. I’m a little more reserved and analyze before speaking. We would balance each other out nicely. She could speak her mind and I can smooth out the rough edges. That would be a lovely balance indeed, Shasta! I like your thinking! This book is very unique and blends facts and fiction together. I would love to get my hands on the book and admire the illustrations inside. If it is available on Amazon US, I will purchase it right away. I would like Elizabeth Bennet to be my friend. She is witty, intelligent and throws back any insult that she receives. And I am fond of reading too, just like her. It’s not released until 1st October, I’m afraid, but you an pre-order at the link above! Good choice in Elizabeth – she is definitely the most popular one so far! It will be sold on Amazon UK with a world-wide postage. I hope it helps. You can pre-order it now – it will be cheaper and still will be posted world-wide. I ordered the book when you first opened for orders and I am trying to patiently wait. Interviews like this are so good that it makes it harder. LOL I am impatient too, Talia! I can’t wait to get my copy! I would love to be friends or have an older brother like Col Fitzwilliam. He is just the sort of chap to cheer me up and would be a good friend to lean on. He was good enough for Darcy so I think he is a good choice. Thank you for your fascinating interview. I am delighted that Ms Grantham’s book will be available for purchase soon. I would choose Anne de Bourgh, because not only because she did not have one, and could use one, but she deserves to experience some friendly relationship that could add color and happiness in her lonesome life. What a lovely sentiment, Zen. ❤ Poor Anne, and with a mother like that too! You're right about her needing a friend. Ohhh, Z… you wet my eyes. So kind. Thank you so much for this post! Lovely interview. Even though Elizabeth is my favorite Jane Austen heroine, I feel like Catherine Morland would be my chosen friend. I’m a big reader like her so we could compare notes on the books we read together. She has an active imagination that could be put to better use than suspecting people of murder! I also like her child-like naivety and kind heart. I was naive like her growing up, and I would love to be a great friend to guide her. So pleased you enjoyed it, Lex! ha! so true, Anna, abt Jane and perfection! i just wrote abt her! she’s a comfort. “She’s as sweet as I wish I could be…” You’re funny! And, same here! Heehee! It’s so true though! I won’t hold it against you, as this post was just fascinating! And uplifting. I so love your sharing the honor bestowed upon the Lyme Park book, Julia. Figured it would be my favorite bit, until the daisies, clover, bees… I love that! I’ve been chompin’ at the bit for Particular Charm 2.0 for some time – hi, Cass! – the same for yours, Julia, from the moment I spied it – now I crave the Lyme book, too! As for my potential friend… most days I would probably say Lizzie… if not, perhaps Fanny, Darcy, Brandon… but today… I long for Jane (Bennet, that is!) She would be just what I need this week. Have a wonderful launch, Julia. LOL. Well, it certainly wasn’t 100 degrees, Karylee! Really sad you won't get to Pasadena on the 24th; would have loved to meet you! What a wonderful comment, Karylee! I feel so happy you liked the post and hope you’ll enjoy the book. I enjoyed working on it so much – in hope it’ll give people a glimpse of Pemberley. Firstly, please don’t enter me in the giveaway as I was lucky enough to win Julia’s giveaway on Joana Starnes’ blog recently and already have a copy of that lovely print and a pendant of the same. I’m so looking forward to receiving my copy of the book in October. What a labour of love it’s been! Congratulations on finally completing the project, Julia. I’m still going to answer fhe question, though. As it’s your blog, Cass, I’m so tempted to say I’d like the Bungley twins as friends. I’m still waiting to see them around town, by the way! But, as they’re not from canon, I think I’d have to say Anne Elliot or Elinor Dashwood as they’re the female characters most like myself. It’d be interesting to have Darcy and the Colonel as male friends, too. I’m leaning towards Anne and Elinor, too, Anji. It’s a great question from Julia. So funny re the twins. I am sure they are there, still in Harrogate, you know, just 200 years away from you! Oh, the twins! Full of energy and joy of life! What fun they would be as friends! I would say Colonel Fitswilliam….he is such an interesting character. He has a great sense of humor and I love to be around people who make me laugh. Elizabeth for a female friend because she has a thirst to learn and get lost in her books. They are both great choices. I can totally understand why you would wish to have them as friends. Elizabeth Bennet would have to be my chosen friend. She loves to see new places and travel, but also seems content with a book, and on her own. Lovely choice, Maureen. Good luck in the draw!